2014; varying dimensions; performance; pen plot; ink on paper. The large-scale modular graphic work Grid was created as a part of the exhibition Summer Dreams at The New Institute, in response to the existing exhibition space. This wall piece was a follow-up of his earlier work CMY. 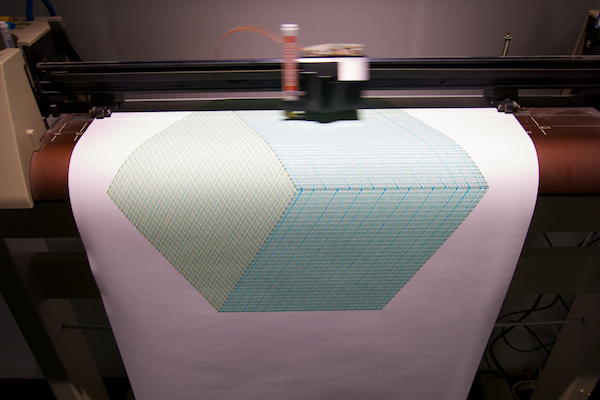 While working with pen plotters, Rogier has developed a technique of cross-hatching colour lines to create a wide spectrum of colour varieties. The work was created in the exhibition space itself during visitors’ hours, between July 8th and July 22nd, 2014. During this period, the surface of the graphic work grew up to three by four meters. Grid is commissioned by Makkink & Bey for the exhibition Summer Dreams at The New Institute, Rotterdam.